Read some of our great reviews and see why people choose Echoes of Time year after year for all their costume and vintage clothes–selection, quality, and fantastic customer service! There is an inexplicable shortage of good vintage shops in Hampton Roads. This is one of the few. And it's a damn good one. They have a great selection of all the major periods of clothing. The racks and display cases are packed to the rims with stuff. I used to be a bit of a vintage freak. When I first moved here I sold a few items to Echoes of Time for some extra cash and they gave me a fair deal. In addition to vintage, they also have a lot of replica costume items: clown noses to '50s specs to disco platforms with goldfish in the heels. It is THE go-to spot for funky Halloween wear to rent/buy. If there's something in particular that you want for a costume, however, make sure to reserve it early. They are super busy at Halloween. They rent all year 'round, even for their regular vintage items. I once rented this great '60s satin skirt for a dress-up party I had at my old job. I had something really unique to wear and I didn't have to pay a fortune for the privilege of having it hang in my closet for the next 10 years. This place reminds me of my grandma's attic, if she had an adult male size gorilla suit in the back. Echoes of Time is a vintage and costume store, making it overwhelming awesome. And when I say vintage, I'm not talking about 80s biker shorts and neon green sunglasses, I'm talking 1920s flapper dresses, Victorian hoop skirts, WWII army uniforms--the works. If you want a truly authentic costume or want to pretend you have a fashion time machine, Echoes of Time will fulfill your fantasies. Expensive? Of course. But I can tell you their costumes are worth it, if it's worth it to you. Me--I'll just stick to window shopping and dropping in for a quick game of dress up. I have a real shopping problem and Echoes of Time is an enabler. I wish this store would just swallow me whole and spit me out, clad in one of a kind vintage pieces. This little hole in the wall in the middle of nowhere is such a wonderful find. Anytime I want jewelry or clothing that everyone will ask where I got and I'll reply, "Oh, sorry, it's vintage," I head to Echoes of Time. Halloween costumes here are perfect too. Want to be an Indian and not look like a sleazy Pocahontas? This is the place. If you're into the scandalous costumes, they've got those too. The only drawback is that you will leave with a drastically lighter wallet. They're aware of their fantastic clothing and jewelry and charge accordingly. Go prepared; make room in your closet with plastic in hand. I go here every year for Halloween and they always have something I like. They're a bit pricey on some things but fair on others. I know you can rent things but I personally haven't done this. I visited Echoes of Time today for the first time. Everyone was super friendly and helpful from the moment I entered the store. The section is HUGE!! Its a bit overwhelming with the amount of costumes they have, but like I said all of the sales associates are very helpful in leading you to the right place! Great selection of costumes and special effects supplies. You will not be disappointed. This place has everything you need for any type of occasion, from Santa suits to Halloween items. Awesome place! This place has a huge selection of Costumes. The people were friendly and you can buy or rent the costumes. I'm glad I tried this place!! I'm (sadly) not local, but any time I travel south to visit family, I make a point of making a pilgrimage to Echoes at least once during my trip! From a plethora of costumes to a vintage collection organized by waist measurement (because vintage sizes are impossible to use with contemporary standards) to a selection of retro dresses to die for (I wear my Universal Monster dress at least once a week), this shop has something for everyone. On the accessory front, they range from true vintage rhinestone pieces to large, plastic costume jewelry, with a large selection of quirky sunglasses. Prices are extremely fair, and though I've never rented costumes from them, their rental protocol seems legit. See you guys around Christmas! This place is so cool. If you have a costuming or theatric need, they probably have it, or if you are looking for something interesting for you wardrobe, you will probably find it here. The staff was very friendly and helpful. Don't let the small frontage fool you, this place is HUGE. As you enter bags and purses need to be locked in a small locker. I didn't mind that at all, I didn't have to carry it around. I'm sure the reason is to prevent theft, I get that. There are rows and rows of vintage and costume clothing. Some are for purchase and some are for rent. What blew me away were all the accessories. I went in for one accessory and ended up purchasing five. The staff was extremely helpful in adding to my purchase. This place is magical! Every time I come here I get lost in the huge amount of items and possibilities! They are always restocking and have the best selection of any costume store I have been to. Great service and decent prices on items that you would have to special order online. Great for cosplay or any costume needs even off season. This place is like a dream for anyone who loves dressing up. You could spend hours easily just having a blast. 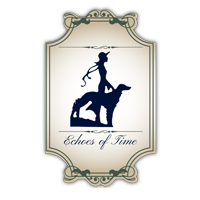 Visit Echoes of Time Today! Click and drag on the photo above to do a virtual tour and walk through of our store and explore all that we have from costumes to vintage, jewelry to stage makeup, masks to wigs at Echoes of Time. We are your go-to source for costumes and vintage in the Hampton Roads area.